Thank you for visiting our Patreon page! We are here to create awesome language related content for you. We have created this Patreon page to support the blog and get a closer connection with you, so we can continue creating materials that are actually of interest to our community. The Foreign Language Collective was born out of a lack of sleep and an overload of enthusiasm for foreign languages. What started out as a simple Facebook page quickly turned into a full-sized blog with interesting articles and our own language learning materials. Almost 2 years later and we have gathered over 200,000 followers on Facebook, and thousands of monthly visitors to our blog. We have created a Facebook community, organized meet-ups, created the 400 Word Survival guide in over 20+ languages, and written over 100 articles related to foreign languages. When I say 'we' it's really just one Dutch student with multiple personalities, all of which are passionate about languages. In reality, saying "I" just sounds a little selfish, and I try to involve people from the community wherever I can. While this is all fantastic, there is unfortunately a limit to the amount of time and money we can sacrifice to keep it going. This is why we have decided to create a Patreon so you can support us financially while we can keep creating awesome language related content for you. We find it important to know what you actually like, and as a Patron you will become part of our inner-circle and get a big vote in what content will be created next. We get to keep on doing what we do, and you get to reap all the benefits, including a free welcome gift! I am currently working on the idea of a Multilingual Urban Dictionary. Over 80% of language learners, including myself, say they struggle with slang. By creating an online dictionary explaining slang and giving additional relevant information on how it's used, when it's used, whether it's offensive or not, and more, maybe we can try to close that gap. It's a passion project that I'd love to start working on, but unfortunately also something that takes up a lot of time and money. Hopefully through Patreon, those funds can be raised. Here is a quick overview of the welcome gift that accompanies each level of support. Once you have made your pledge you will be able to access the post containing a coupon code and a link to a webshop where you can redeem it. Right now we are still setting up the Patreon account. 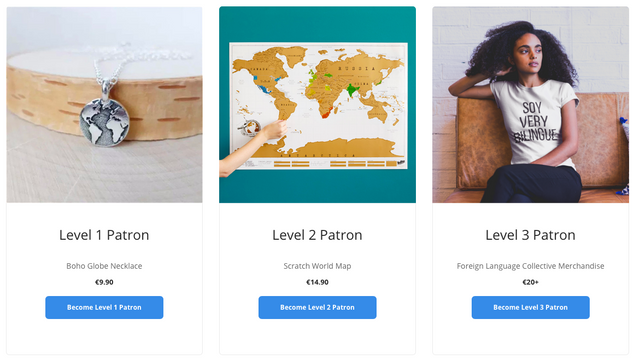 Each level of support comes with a welcome gift, but more rewards will be added throughout and will be immediately available to all Patrons, old and new. Hey there, boo. Your support makes me scream. This tier has no rewards, other than the positively haunting presence of your love. We can all feel it. Your support is out of this world. One thing is for sure - you can always land in my back yard! But let's not get carried away..
Did it hurt? You know, when you fell from heaven? No, seriously though, how do you hide those wings? You are one magical creature! If only there were more like you. I would be eternally grateful if at a $1000 I could have some financial stability and it would allow me to hire some people to take care of certain tasks so I can focus on new projects.